Using fans as weapons is very common. 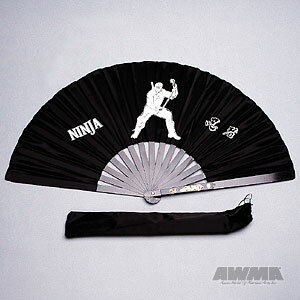 Our Ninja fan is made from gold finished aluminum with a black finish and a black nylon taffeta cloth. Stick is 14 3/4" long sticks and measures 27 1/2" wide when opened. A nylon cloth bag is also included for easier carrying and storage. Weighs 8 oz. Also available in a Kung-Fu style.